This message is going out to old and new friends and everyone else along the way. 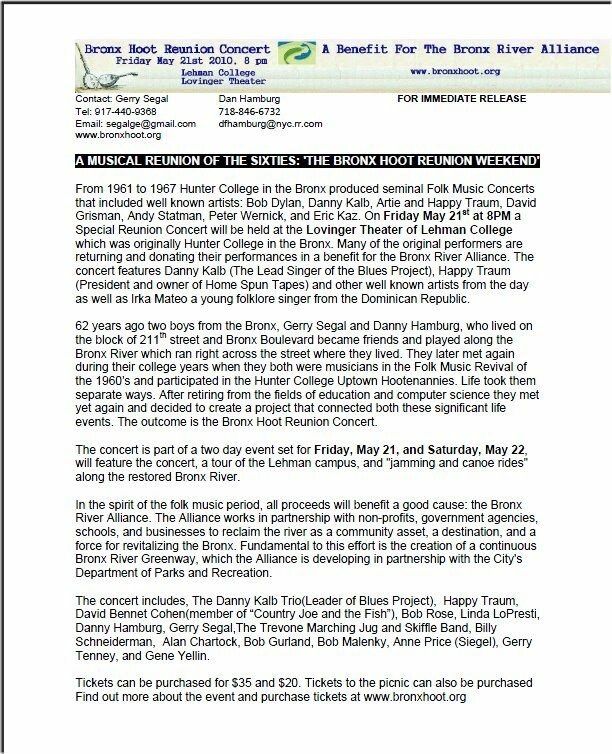 I'm unabashedly plugging the "Bronx Hoot Reunion Weekend" www.bronxhoot.org Also see the attached Press Release. If you can attend any event please let me know so I can greet you. If you have any friends who I might have missed I would be very grateful if you can forward them the information. Finally, I think you'll enjoy the website which contains old pictures; sound recordings from the old concerts; and, a chance to write a memory or two on our Wall. My best regards to you for the Spring Holidays.